“Suddenly” is a small town in the sticks which suddenly hears its going to get a surprise visit from the President. Or, rather, the town’s sheriff hears the news from the secret service; it’s all very hush-hush. But not hush-hush enough, it seems, because some trained assassins come to town and commandeer a house with a nice view of the railway station — and hold the family that lives there hostage. Chief assassin is named John Baron, and is played to perfection by Frank Sinatra. I’m not a huge fan of Sinatra’s music, but he was a hell of an actor, and he does a great job portraying this psychopathic killer. This movie is infamous because its plot uncannily resembles the events of the JFK assassination, and, because of this, it was withdrawn from the public. Rumor has it that Oswald had seen this film on TV a few weeks before he killed the President, although this appears to be untrue. In any case, Suddenly fell into the public domain, explaining its presence in this collection of mostly turkeys and B-films. Not a B-film and most definitely not a turkey, this is a very tense thriller, with a load of talent in the cast. Besides Sinatra, there’s Sterling Hayden as the Sheriff, and character actor James Gleason as one of the hostages. A gangster, leaving a swanky restaurant, encounters a strange woman who, much to his surprise, gives him an enthusiastic kiss. Little does he know, he has just been marked for death. Once the hot dame is out of the way, the big shot gangster collapses under a hail of bullets. They decide to do a retake. But the actor playing the gangster doesn’t move. Seems there were real bullets in those guns instead of blanks. That’s the opening scene to The Death Kiss and it’s pretty good. Unfortunately, it’s all downhill from here on out in this comedy-mystery. The cast does a lot of grinning, smiling, giggling, and chuckling, for no particular reason; I suppose they were trying to remind the audience that this is, in fact, a comedy — a hard thing to remember because nothing in this movie is funny. But . . . this flick has Bela Lugosi! And he’s not a vampire, just a murder suspect. Lugosi doesn’t say anything funny, either, but at least we get to see his trademark mysterious expression of, um, mysteriousness. Mea culpa. I dozed off during this movie because it was silly and dull. I did wake up in time to see the real murderer exposed; he had a familiar face, so I’d seen him before, but I couldn’t remember which character he was or his possible motive, and, what’s more, I didn’t care. Rating: Lugosi pushes the score to a 2/5, but just barely. Both as a kid and a teenager, I was a compulsive reader; I read whatever I could get my grubby hands on: Batman comics, the Oz series, the Divine Comedy, tomes on Egyptian history, matchbook covers, the backs of cereal boxes, Mad Magazine, and so on. Somewhere in the mix, I stumbled on the inevitable Hardy Boys and Nancy Drew. To be honest, I don’t recall much about them; I vaguely remember Nancy looking for a ruby hidden aboard an old ship, but maybe that was a Hardy boys tale. So, I settled down to watch this Nancy Drew flick, feeling a bit nostalgic, ready to revisit my misspent bookworm youth. But — what the hell! Who was this ditsy blonde chick? I should say, this amoral ditsy blonde chick. I may not remember too much about the plots, but I do remember Ms. Drew as being a decent person. What had Warner Brothers done with Nancy Drew? Or was my memory to blame? It was time to do a little research. It’s hard to believe that Nancy Drew is over 80 years old. The first N. D. novel, The Secret of the Old Clock, was written in 1929, and printed the following year. She was created by Edward Stratemeyer who owned the Stratemeyer syndicate (they produced a number of children’s books), but the stories were authored by a several different ghostwriters using the name Carolyn Keene. Mildred Wirt Benson wrote most of the original series; she deserves the credit for making Nancy a strong and feisty character. Nancy Drew lives in the midwestern town of Riverton Heights, which, despite being such a wholesome, all-American city, seems to be riddled with criminal activity. Nancy’s dad is attorney Carson Drew, her mother died when she was very young. She was raised by her doting father and housekeeper Hannah Gruen, who is more of a surrogate mother than a servant. Carson Drew must be quite affluent, or perhaps Nancy inherited money from her deceased mother, because the 18-year-old sleuth not only does not attend school, but doesn’t have a job, either. Plus, there’s no indication she gets paid for her detective work. Maybe the money just grows on trees. Nancy is accompanied in her adventures by a number of friends. Chief among them are plump girlie-girl Bess and tomboyish George (presumably short for Georgette or Georgina or some such name). There’s also Nancy’s boyfriend Ned, a student and football- player at nearby Emerson College. None of these people have jobs, either, so they’re readily available whenever Nancy needs help on a case. But we never find out what Ned wishes, because the mood is broken by the sight of a girl walking zombie-like into the lake, and, of course, Ned and Nancy must go to the rescue. Oh, yeah. I forgot to mention — in my research, I thought I should read a Nancy Drew book. Once again, I turned to the county library system, which had quite a few N.D. novels in stock, and they didn’t have to be dug out of central storage, either. That doesn’t mean they were readily available — most were already checked out, a good indication that the young sleuth remains very popular. I wanted something from the era of the movie, or as close as possible, and settled for a three-story collection. This volume consisted of The Hidden Staircase (the second novel, published in 1930), The Ghost of Blackwood Hall (1948), and The Thirteenth Pearl (1979, and the last novel of the original series). The Nancy Drew novels went through some heavy revisions during the 1960’s, partly to remove offensive racial language, and partly to “modernize” them. This meant removing a lot of descriptive material and shortening the books to 20 rather than 25 chapters, the excuse being that modern readers had a short attention span. Or maybe it was just cheaper to print shorter books. In any case, I was hoping that I could read an original version of an older N.D. novel, but I was out of luck. All three stories were 20 chapters long, marking them as the revised material. That’s a fairly minor issue, though, as I still got a good feel for the character of the young sleuth. And I was relieved to find that the Nancy Drew of print bears little resemblance to the Nancy Drew of this movie. Nancy Drew, Reporter is the second of a series of four movies produced by Warner Brothers in the late thirties. They differ from the books in a number of ways. First of all, they’re comedies; the novels, while containing some humor, are serious tales. Secondly,and most importantly, the character of Nancy– The Nancy of the books is honest, courageous, level-headed, and decent. The Warner Brothers Nancy may be courageous, but is also dishonest, manipulative, unscrupulous, and a bit of a ditz. You see, Nancy and her fellow high school students (yes, Nancy is a student; that, at least, is a bit more realistic than the novels) are offered a chance to write an article for the local newspaper. Wanting to write a “real” story, Nancy steals an assignment off the desk of an absent reporter and she’s blithely on her way. The assignment is to cover the trial of a woman accused of murder. By now, you’ve probably guessed the outlines of the main plot. Miss Drew decides the woman is innocent, and sets about proving it. She needs some help to do so, of course, and so resorts to deceit and manipulation to get other people’s assistance. Now, personally, I’m finding this a bit distasteful, especially since WB seems to be winking at us, and saying, “But she’s so cute!” Evidently it’s perfectly okay to lie, manipulate, and steal as long as you’re a cute, perky blonde. Ah, you’re saying, but surely this is all for the greater good? After all, the book Nancy will resort to subterfuge if necessary, she’s not completely straight arrow. Well, the thing is, Nancy’s motives are not exactly altruistic. Sure, there’s a woman falsely accused of murder. Nancy intends to find the real murderer. But, you see, the newspaper is offering an award for the best article, and Nancy wants that award. She wants it bad. The fight for justice is a side issue. Now, if you’re getting the idea I didn’t care much for this movie, well, you’re right. I didn’t. But I need to be fair. This isn’t a bad movie at all; the plot and script are good, it’s well-acted, and it actually is quite funny at times. So, in spite of my distaste for this version of Nancy Drew, I give this movie a thumbs up, even though I’d rather not. Needs a kick in the pants. Quite frankly, I’m in total agreement with Mr. Nash. But let’s back up a bit. Who’s this Vance character, anyway? Philo Vance is an immensely wealthy New Yorker, who lives in a swanky apartment in Manhatten, has a valet named Currie, and a lawyer who works exclusively for him. This last is S.S. Van Dine, who both narrates and is the official author of the stories; in reality, the novels were penned by critic Willard Huntington Wright. Wright created the character after recuperating from a heart ailment (or, as some sources have it, a collapse brought on by cocaine addiction). Encouraged to avoid any mental strain, Wright began a reading program of detective fiction, and got the idea he could do a better job than other crime fiction writers. And, for a while at least, a lot of people agreed with him. Philo Vance was a big hit with the public; not only were the novels best sellers, but they were quickly adapted for the big screen. Why the Vance novels were so popular is a mystery in itself, given the unpleasant nature of the lead character. Certainly, many fictional detectives have irritating characteristics, but Philo is downright obnoxious. A poseur and dilettante (even though Van Dine claims he isn’t), an arrogant snob, and a pedantic jerk — is there anything even remotely likable about this guy? Well, okay, maybe I’m jumping to conclusions. To be sure, I had heard the names “Philo Vance” and “S. S. Van Dine”, but had never read the books. So I turned to the county library system for help. They did, indeed, have several Philo Vance novels in stock, albeit in central storage. The Kennel Murder Case was not available, but I did obtain the very first novel of the series, The Benson Murder Case, published in 1926. It’s rather plodding, although the mystery itself — once we finally get into it — is well-crafted. We are, of course, introduced to all the main characters, Vance himself, Van Dine (who actually remains silent throughout the whole novel — he is a narrater who does not participate in the action), District Attorney John Markham (supposedly a close friend of Vance’s, in spite of the contemptuous way the snobbish detective treats him), and the none-too-bright police Sergeant Heath. It’s not a horrible book, really , but I wouldn’t care to read another in the series. Philo Vance gets a thumbs-down from me. Is it reasonable to form an opinion based on reading one novel? Probably not. But at least I have Ogden Nash to back me up. In all fairness, though, I should mention that the Philo Vance books had a great influence on crime novelists of the twenties and thirties, including Ellery Queen, who adopted the device of narrator-as-author. After reading the first Vance novel, I wasn’t really keen on seeing The Kennel Murder Case. But I was pleasantly surprised. The movie eliminates Vance’s unpleasant aspects — out with the arrogant snob, and in with the charming and debonair man-about-town! 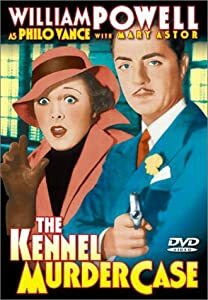 William Powell is perfect in the role, suave, elegant, and likable, he only superficially resembles Wright’s creation,( but that’s okay with me!). Mary Astor, a fave of mine, does her usual wonderful job, but, alas, gets too little screen time. This is a very well-crafted mystery centering on the apparent suicide of a very unpleasant man. There’s no shortage of suspects, and, yes, as the title implies, dogs do play a role in the plot. There’s a good deal of humor, although the comic scenes involving Sergeant Heath are a little heavy-handed. If you enjoy classic who-dun-its, you will probably like this movie. If you’re a masochist, you might enjoy the original novels. It’s nippy out and I’m pretty well caught up in the Doctor Who Nap Year Marathon. So I’m thinking the best thing to do is stoke up the fire, make some popcorn and watch a couple of classic horror flicks. My choices for the evening are Frankenstein and The Bride of Frankenstein, both from the 1930’s with Boris Karloff as the Monster. Now, I’ve never seen either of these before, so I was in for a pleasant surprise. Both movies were far more sophisticated than I had expected, certainly more so than the also classic Dracula from the same era. The first movie suffers a bit from wooden acting (mostly seen in Frankenstein’s fiance), but Karloff’s monster is superb, a creature both frightening and pitiable. The special effects are quite good; so is the script, albeit a bit stiff in places. It’s unusual for a sequel to be better than the original, but Bride is the superior of two good films. It’s witty and thought-provoking; the only complaint I have is the character of Minnie, who is meant to be comic, but only succeeds in being irritating. Karloff once again does an incredible job as the Monster, who remains pathetic but now has a grim edge to his character. There is one thing I’m wondering. The scene with the Monster and the Hermit. The latter is clearly no ascetic, and shares with his new friend bread, wine . . .and a smoke. This is all accompanied by much giggling and exclamations of “Goooood, gooood!” WHAT THE HELL ARE THEY SMOKING? I watched this great old movie earlier this evening; actually, it’s my second time. Didn’t care for it much the first time around, but tonight it really clicked for me. Garbo is magnificent as the queen, whether masquerading as a man, or dressed in royal finery, she’s just stunning. The script is good, even if a bit cornball at times, but less so than many movies of this era. There’s a good deal here that’s quite daring, even by today’s standards: the gender-bending scenes, the not-so-subtle hints of homosexuality, the eroticism. Ultimately, though, the film affirms some very traditional values. I note that Christina drops her masculine attire — and her interest in her lady-in-waiting –after her affair with Antonio. It’s as though the film were saying, “Look, all she needed was a good screw from a real man” And then the movie culminates with Christina abdicating power for the sake of love. On the plus side, Christina is depicted as a very capable ruler, who just gets fed up with not being able to have a personal life. In that, most of us can sympathize with her. We may not rule a country, but we can relate to the conflict of duty and self-interest. Christina chooses the latter, and ends up losing not only her kingdom, but her lover as well. This, of course, is a fictional Christina. The real queen of Sweden did indeed abdicate, but not for love. My knowledge of the era is pretty sketchy, but I gather that religion was a factor. (Christina was a closet Catholic in a solidly Protestant country). She often did dress in male attire, and may have been bi-sexual. (The actual nature of her sexuality seems to be under debate). I’d like to read her biography, but that will have to wait until later. Tomorrow: Back to my Whovian marathon. The second Doctor’s era begins!